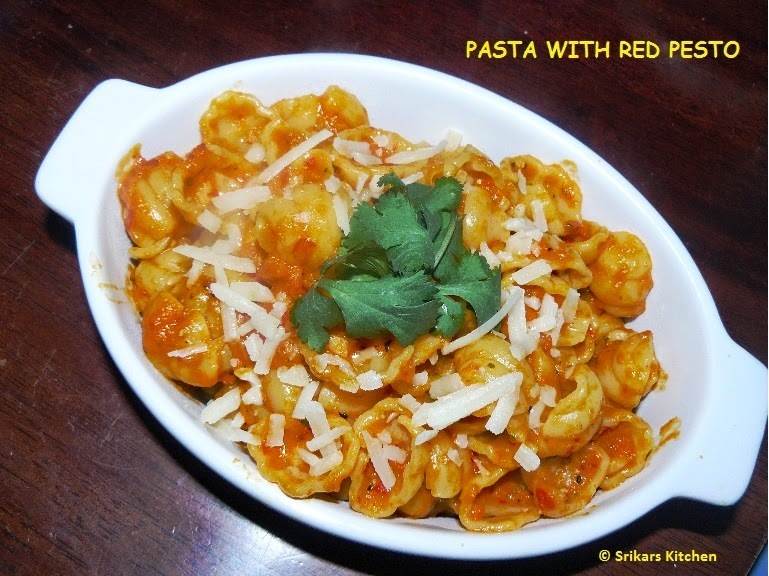 This is simple & easy to make pasta recipe. Boil the pasta for about 10min until it reaches 'Al Dante' & drain it. Drizzle oil to avoid the pasta sticking. Blend with red bell pepper(capsicum),garlic, redchill flakes,2 tsp olive oil,basil leaves & parmesan cheese to make a fine paste. Heat oil in a pan, add chopped garlic,red chilli flakes & sauté. Add blended sauce & allow to boil. Add crushed pepper & Boiled pasta. Allow to blend & finally add parmesan cheese. Serve hot with little parmasen cheese on top.